So... early September of 2011, having a spare afternoon to spend before the flight back to HK, I fixed an appointment for a gait analysis with StrideUK, based in Hove (which is basically a suburb of Brighton). DISCLAIMER: I did not receive anything from StrideUK for this review. I paid for the analysis on my own (which was a non negligible 160 GBP). These notes are only my personal experience which can guide the reader to have a similar analysis done somewhere else. flexibility test of different segments (calves, hips, etc). Mitchell, the owner, really stands out in the crowd of the all the gait analyst which I met until now. Why ? because he took a "white sheet of paper" approach, without any pre-assumption on the needs of orthotics or this or that kind of shoes. Different from many labs, where a way to get extra income is pushing the envelope for this or that insole, he is not connected to any insole/orthotics manufacturer. I was incredulous when he told me that maybe I could even run without orthotics because my feet (despite hitting the ground at an angle), do not actually roll at all during the pushing stance. 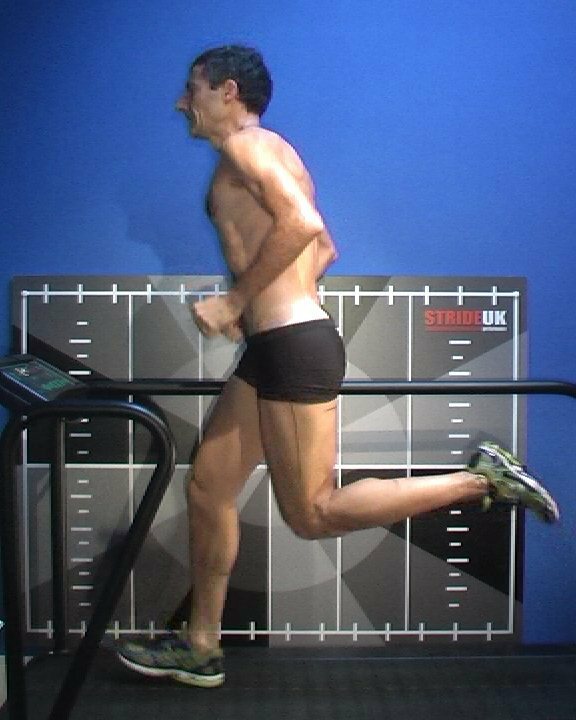 So we went through the whole process checking my static posture, barefoot running, running with shoes, etc and later discussing the images together so that I could also give my own opinion and understand the "why" of each image. We spent almost 2 hours together and he really made me understand the how and why of each step. 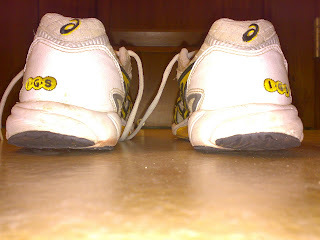 Running (either barefoot or with shoes), back view. As you can see from the photo at the left, my foot hit the ground with quite an angle from the vertical. There is nothing I can do about it, it is related to my bow legs (see previous post on the matter). The major drawback is the added strain on the Achilles and also that all the impact load goes to the inside of the shoe. 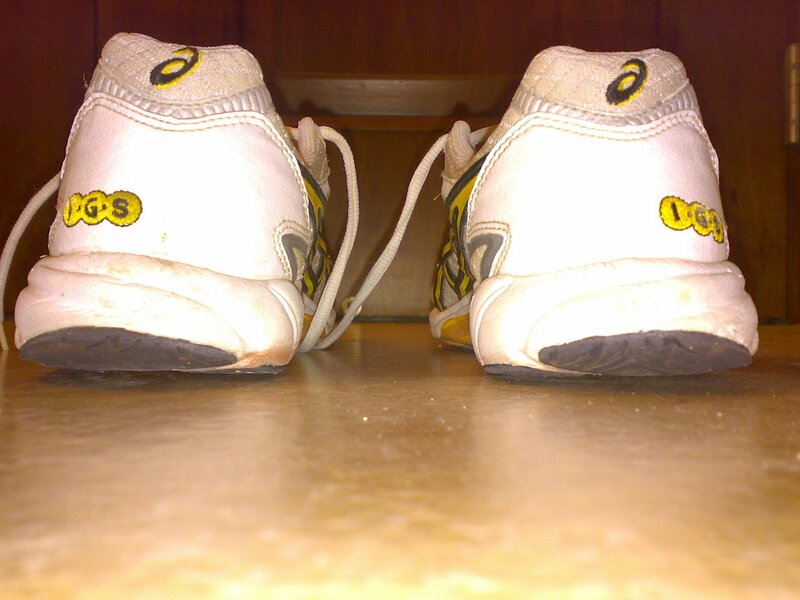 I also have some custom made orthotics designed in a way to try to align the leg and the ankle during the run. you can notice how the feet did not actually tilt inward more or with the ankles rolling-in like it happens to real "pronators" (of which Mitch showed me an example). So system foot/ankle/leg remain "aligned" (well.. in a broken line) during all the contact with the ground. The same back view wearing shoes (with and without orthotics) confirmed the pattern. Hence, the analyst did come out with the suggestion that I might not really need orthotics at all. - running with neutral light-weight show (aka marathon shoes or lightweight trainers) PLUS orthotics for hard workout, long runs, serious training, races, etc... that should make a good balance between efficiency of the stride and the need to contain the "inward" forces during the landing phase (forces which either quickly destroy the shoe or my foot (or both)). Running (either barefoot or with shoes), side view. Actually now my leg lands on the ground with the foot in almost ideal "full foot" strike. The foot can dorsiflex at the very last moment for an almost ideal landing !! 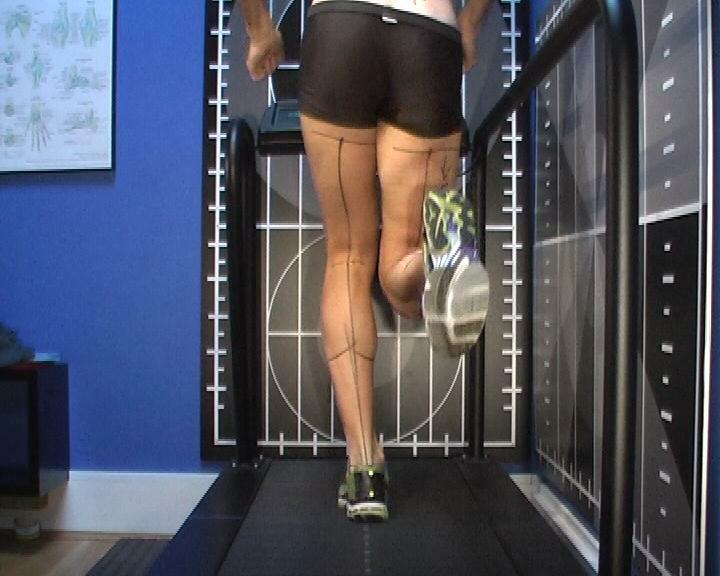 The gait pattern seen from the side is much better of what I had expected. 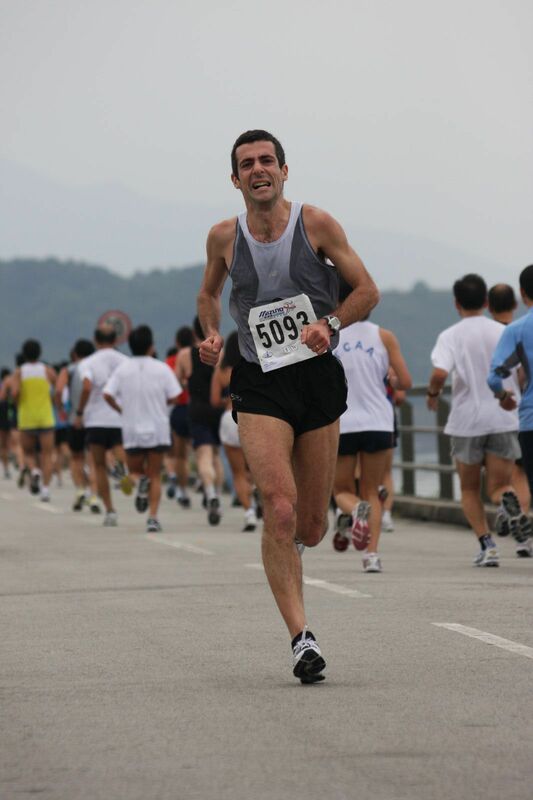 Also the analyst remarked that I do run "almost" in proper form. - the right glute is not activating fully, so the movement of the right leg is not as fluid as the left one. Running (either barefoot or with shoes), upper body. It is evident from the pics that my hips/glute strength is not enough and the other part of the body is "collapsing" during the stride. Overall I felt that I was satisfied of the visit... for me, it was money well worth. I would have like to have even more time to try all the possible configuration of shoes/orthotics that I have, but 2 hours is already a solid chunk of time. Now, if you are running without injuries and you are satisfied of your running, most likely you can save yourself the hassle and the money and keep on going like you are already doing. Myself, I have now very clear what I should do... the only problem is finding the time to keep up with all the recommendations. It will be nice to have reports from other people who had similar experiences with gait analysis, I will try to add them at the bottom of the post ! Thanks for the report. 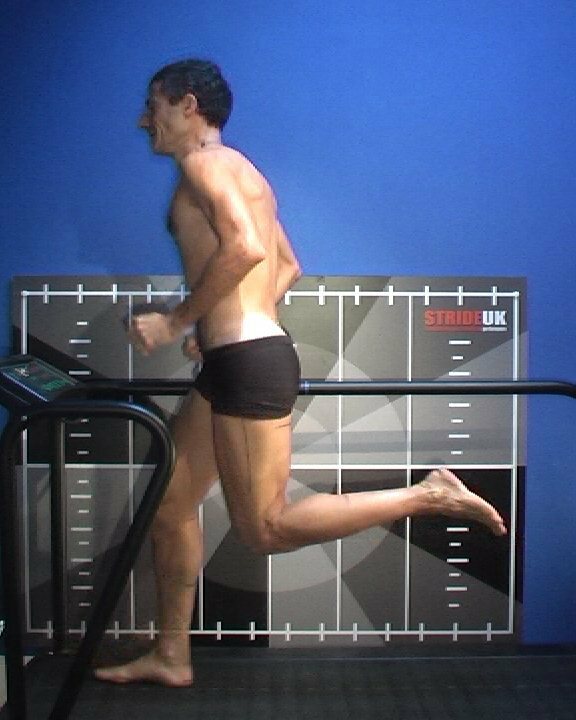 I've never had gait analysis done but would now if there was a recommended place here. Interesting about the different foot-strikes with shoes and barefoot - to be expected. Using a heel lift on one leg? Not sure about that - perhaps if it could be done gradually, millimetres at a time. I know Bill Rodgers had a quite substansial lift on one shoe.